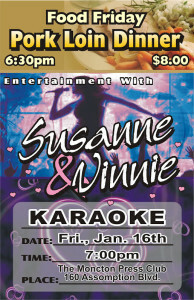 Susanne & Vinnie were back to The Moncton Press Club this past Friday, Jan 16, with their brand of Karaoke. The crowd was about 40 people. Not large but very enthusiastic. Participation from those in attendance as performers was stellar. 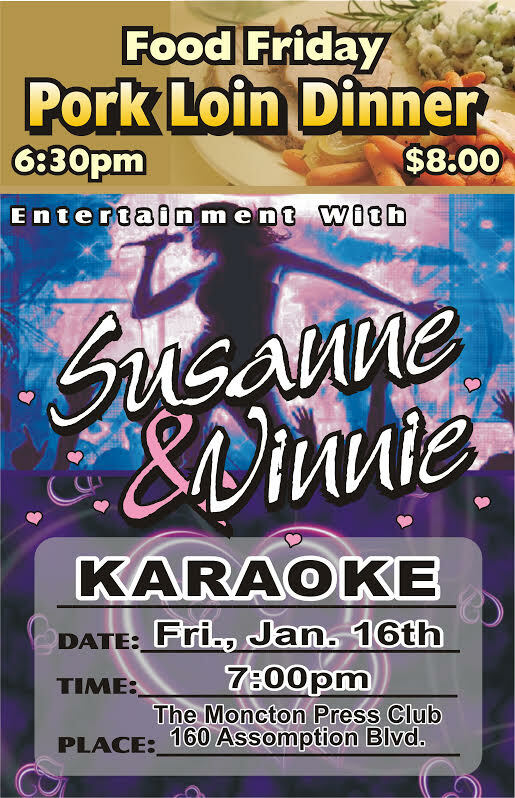 Vinnie provided us with some light comedy and on going patter between performers and Susanne made cuing up the tunes look easy. As a performer herself, Susanne certainly sings with a very beautiful voice. Vinnie is not bad either; just not as pretty but his hat fits well. It was also Food Friday and the staff served up some very delicious plates of pork chops with potatoe and carrots. Well attended and well received. I don’t think there was a clean table in the place until later. A meal that only cost $8.00 for which you would have paid a minimum of $14.00 anywhere else in town. You owe it to yourself to check out these Food Friday events if you haven’t been coming out. See you next time. Watch our Calendar and Weekly Feature for announcements.